Thomas was born October 12, 1921 in Detroit to the late Thomas and Gabrielle Witherspoon. On July 6, 1946 he married Catherine Hubbard. Thomas graduated from the University of Detroit and was a teacher in the Dearborn School District for over 30 years. Thomas was an avid fossil hunter. He would take the students of the East China School District on field trips fossil hunting to Arkona, Ontario. He is a former member of St. Alphonsus Church, Dearborn, where he served on the Ushers Club and was active with the Senior's Group. 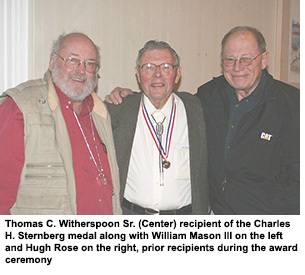 A long-time member of AAPS, Thomas was the fourth recipient of the Charles H. Sternberg Medal in February 2007 during the annual AAPS meeting. He was nominated for the award for all of the young students he inspired, that later went onto careers in paleontology or teaching. Thomas C. Witherspoon, age 92 of East China Twp., formerly of Dearborn, died January 19, 2014. He is survived by his wife of 67 years, Catherine Witherspoon, sons, Thomas Witherspoon and Timothy (Therese) Witherspoon, grandchildren, Tim, Mary and John Witherspoon and many nieces and nephews.